THURSDAY, Nov. 8, 2018 (HealthDay News) -- Treatments for "tennis elbow" are generally ineffective, researchers say, but don't despair: The painful condition will usually clear up on its own. Each year, approximately 200,000 Americans are diagnosed with tennis elbow -- inflammation caused by overuse of the tendons in the forearm. The condition can affect anyone who uses their hands and wrists for hours each day, such as carpenters, food workers, manufacturers and office workers. Patients can choose from a host of treatments, including steroid injections, physical therapy, acupuncture, anti-inflammatories, Botox injections, ultrasound and laser therapy. But significant pain relief from these options is unlikely, a new study found. 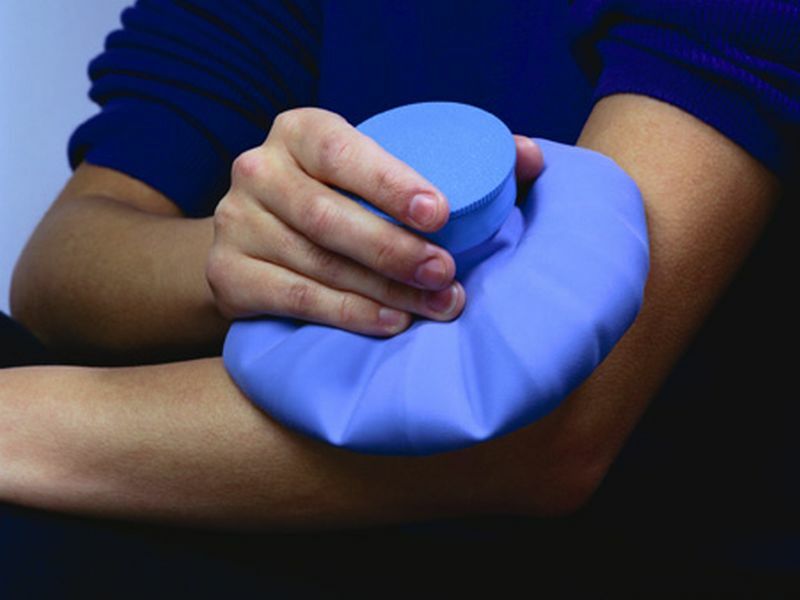 "We evaluated almost all of the nonsurgical treatments available for tennis elbow and showed that they provide only minimal effect over placebo," said study author Dr. Amin Mohamadi, a research fellow at Harvard Medical School. For example, corticosteroids were more effective than a placebo within the first four weeks, but they lost their advantage after that, he said. So what can someone with a bum elbow do? Doctors can opt for a pain reliever to manage symptoms on a patient-to-patient basis, Mohamadi said. His team suggested this be limited to four weeks. "Our results imply that for most patients, tennis elbow is a self-limiting condition," he said. "Based on these findings, the overall recommendation is wait and see." Dr. Steven Beldner is co-director of the New York Hand and Wrist Center at Lenox Hill Hospital in New York City. Beldner, who was not involved with the study, agreed that for most patients, tennis elbow gets better by itself. "The question is, do people really want to suffer with this condition for six or seven months?" he said. The pain can be so great that some people may have to avoid using their arm, he noted. And not every case of tennis elbow will improve unaided, Beldner added. "Five percent of people who have this, no matter what treatment they undergo, will not get better and will eventually need surgery," Beldner said. For the study, Mohamadi's team reviewed 36 previously published studies that included more than 2,700 patients. The papers evaluated 11 nonsurgical treatments for tennis elbow. The researchers looked at the effects of treatment on pain and grip strength at four weeks after diagnosis, between five and 26 weeks after diagnosis and after more than 26 weeks. None of the treatments showed any significant benefit within four weeks of diagnosis, according to the study. After 26 weeks, the researchers found that 99 percent of patients who received placebos such as saline injections or sugar pills had little to no pain. At five to 26 weeks, those who had laser therapy or Botox injections said they had a small but statistically significant reduction in pain, compared with those who had other treatments. After 26 weeks, only those treated with shock wave therapy reported any long-term benefit, compared with other treatments. Patients who had steroid injections complained of worse pain than those given placebo injections, the researchers noted. Regarding grip strength, only laser therapy outperformed placebos, the researchers said. The study also found that reported side effects were more prevalent among those given a real treatment than those given sham treatment. But for manual laborers who can't "wait and see," earlier treatment might help, the researchers said. However, that needs to be proved in randomized trials, they added. The report was published Nov. 1 in the American Journal of Sports Medicine. The American Academy of Orthopedic Surgeons offers more on tennis elbow.